Washington, DC - In partnership with the Alliance for Peacebuilding and Beyond Conflict, El-Hibri Foundation is bringing leading neuroscientists together with experts in peacebuilding in order to share interdisciplinary insights. The purpose of conference, and the series of which it will become a part, is to further advance how humans can reframe conflicts and unlock the prejudices upon which they are often based, utilizing emerging understandings of how the human brain actually works. Co-founder and Chair of Beyond Conflict Tim Phillips started off the two-day intensive collaboration conference by talking about how experiences in the field led him to seek deeper insights into the drivers for conflict, including examining what we know about “our common operating system, the human brain” and how it processes emotions and develops identities. Phillips was joined by pioneering neuroscientist Emile Bruneau, from MIT’s Saxelab, who has made stunning advances in seeing how stereotypes are formed and reinforced, how empathy develops, and how such things might be rewired to advance peace. By culling learnings from literally seeing how we think, not just what we think, scientists and peace practitioners are trying to both prevent and also more smartly address existing conflicts. The approaches address both affective and cognitive activity. 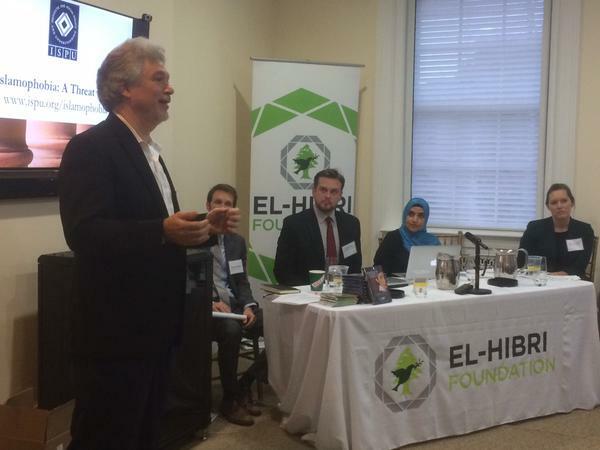 Several of El-Hibri Foundation’s grantees who are working to advance understanding of Muslims and Islam are among the featured participants. Religions for Peace’s Aaron Stauffer, for example, is sharing efforts in Central Tennessee using the research-driven approach of collective impact to foster better intergroup relations. For another example, Unity Productions Foundation’s Alex Kronemer is highlighting the insights from neuroscience that have been used to inform both his company’s filmmaking and TV-industry advocacy efforts. The opening session of the conference is available for viewing at www.elhibrifoundation.org/live (also http://youtu.be/WeUkMj2Iqwc) and the conference long discussion can be followed on Twitter via hashtag #neuropeace and the handle @ElHibriFdn. Pictures from the event are available here.